This zesty Nicaraguan Gallo Pinto is a Healthy Living beans and rice dish that's ready in just half an hour. Cook dressing, onion and garlic in large skillet on medium heat until onions are tender. 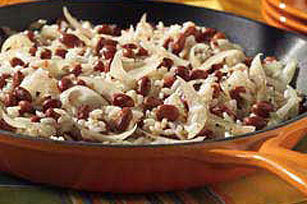 Stir in the beans with the reserved cooking liquid; cook 5 min., stirring gently to avoid mashing the beans. Add rice; cook 5 to 8 min. or until heated through, stirring occasionally. Do not add salt to the water when cooking the beans as salt tends to toughen the beans. If you don't have any of the cooking liquid from the beans, use 1/2 cup chicken broth instead.